I appreciate this nomination from the thoughtful writer Belsbror. It’s one thing to encourage me to shine on. Another to declare I am of such influence. B, thanks again for all the incredible support. I like the tenor of your writing. Keep up the great work. Gabriel, I didn’t need double affirmation. I would rather you have chosen someone else. Although with you in my corner, I do feel all the more a legitimate member of the literary blogging community. I invite readers to visit Gabe, see the many things he has to say so well. 1. Put the logo in your post. 2. 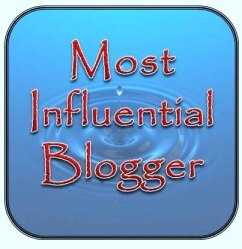 Link back to the blogger who nominated you. 3. Answer the questions below. 4. Pass on the award to 11 others. I’m going to flip the last two. 1. What makes you happiest? Making music a close second but this season, writing writing writing. 2. Do you love the oceans or mountains more? Ocean, to take in. Mountains, for their healing energy. 3. What has been a special moment in 2012? When I lopped off the hair that had gone untended two years and would spook Husband to find me standing there quietly, an eerie simulacrum of Rapunzel in the night. Suddenly, I could see myself again. 4. What’s your favorite quote? Music expresses that which cannot be said, and on which it is impossible to be silent. 5. Do you like yourself? LOL. Used to, very much. Have sobered up a lot. 6. Do you stay up ’til midnight on New Year’s Eve? Nope. I like to function on the New Year. 7. Something you wish could be done ASAP. Healing for the sick and dying. 8. What was your favorite class when still at school? 9. What musical instrument have you tried to play? I play the piano, keyboard, guitar. 10. Anything you wished to have learned earlier? 11. Do you like to do crafts, drawing or painting? I enjoyed painting to my great surprise – high school senior elective. Thanks to my wonderful readers for your time. This entry was posted in Blogging, Writing and tagged Blog, Blog Award, Blog Awards, Blogger, Blogging, Communication, Words, Write, Writer. Bookmark the permalink. Thank you! I’m truly honored. Congratulations to you for your award. Thank you so much for nominating me.. Really appreciate it. Pardon me but there could be a delay in posting it. And thank you for the hearty support and follow.